Amblyopia is a medical condition that is commonly referred to as lazy eye. A person with amblyopia will have decreased vision in one or both eyes. This is usually caused in infancy or in childhood due to abnormal development in the eye or eyes. Generally, only one eye is affected, but there are rare cases in which both eyes can be harmed. Fortunately, if amblyopia is caught early in life, it is relatively easy to combat. However, allowing it to go on without treatment can lead to further severe visual disabilities later in life, such as blindness. Amblyopia is best detected in children, and you should always check your child for any of these symptoms. One of the most common symptoms of amblyopia is strabismus, which is also known as crossed or misaligned eyes. The eye may have poor control and will not be able to look in one direction as strongly as the other eye. Another common sign of ambylopia is your child’s vision becoming worsened when you cover one of their eyes. You can test this by covering each eye while the child is reading or watching TV, and checking to see if they become fussy with a particular eye. Strabismus can lead to strabismic amblyopia, where the brain ignores signals from one eye to avoid double vision. Refractive amblyopia occurs when light cannot pass properly through the lenses of the eyes, even though they are perfectly aligned. In some circumstances, only one eye may suffer from nearsightedness or farsightedness while other one doesn’t. Deprivation amblyopia is when improperly developed vision prevents light from entering a baby’s eye. This is often a cataract that must be treated in order to let the infant’s eyes develop properly. There are several different treatments available based on the type of amblyopia and the severity of the disorder. In some cases, mild refractive amblyopia can be cured using just glasses or contact lenses. These will correct the refractive errors in both eyes. However, other cases may require the use of an eye patch. Strabismic amblyopia can be treated with strabismus surgery, which straightens the eyes. After this, eye patching must be performed and will often be followed by vision therapy. Patching might need to be done every day for several hours at a time and might take place for weeks or months. 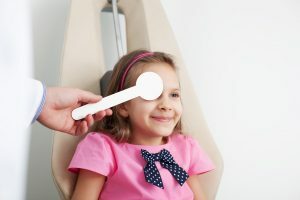 If your child doesn’t like the patch, you can opt for a special contact lens that will keep light out of the eye and which may look more favorable to your child. There are also special glasses that function to encourage the eyes to work together, and they can be used on both adults and children. Eye drops can be administered as well. These special atropine eye drops create blurred vision in your child’s good eye, which forces the bad eye to be used more, which consequently helps to straighten out the amblyopia. Many children prefer using eye drops over using the patch, as it means they don’t have to keep something uncomfortable on throughout the day. However, some children don’t care for the way the drops feel. To learn more about Amblyopia, Lazy Eye, and Strabismus, contact Utah Vision Development Center today. There are multiple treatment options available and we are committed to finding what works for you and getting you the best results possible!